We are perhaps very fortunate that the beginnings of Stobs Camp directly coincided with the explosion in popularity of postcards. They had quickly became the standard medium for transmitting short messages. They were cheap and reliable, with up to seven postal deliveries a day. People bought them to keep as souvenirs as well as to send to friends. Millions of postcards went through the postal system every week, and a high proportion finished up in someone’s album, to be rediscovered by collectors in the second half of the twentieth century. That is why for Stobs, we have so many fascinating views of the Camp prior to the Great War (and a dearth after the Great War when postcards lost their popularity in favour of the telephone). 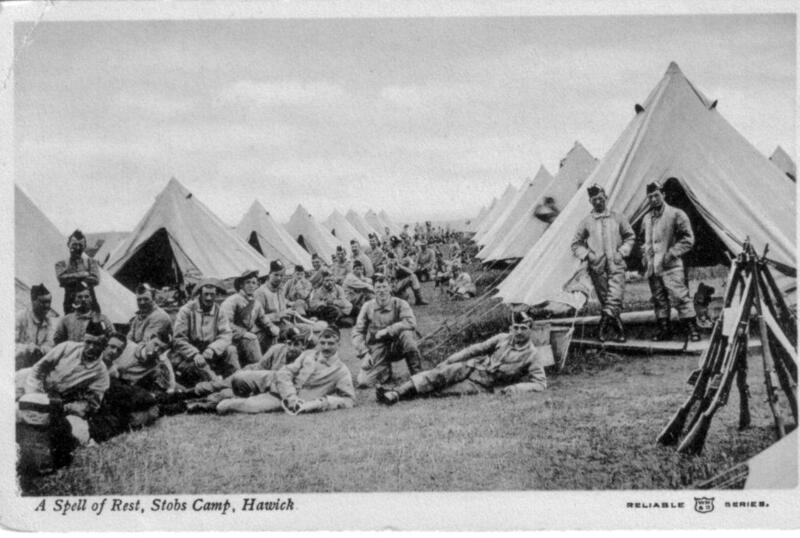 As a guage to their popularity, in 1907, the ‘Scotsman’ reported that during the training season 27,853 postcards had been sent from the YMCA hut at Stobs, and 5,950 ‘postages’ had been recorded at the Church of Scotland Young Men’s Guild tent. 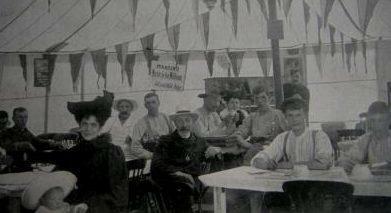 Postcard writing at the CHURCH OF SCOTLAND GUILD RECREATION TENT, Stobs Camp.